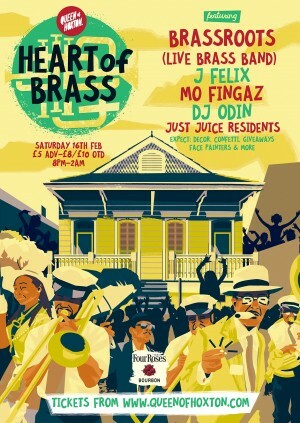 They’ll be playing their Brass Heavy take on feel-good classics, original songs and mashups alongside our carefully selected roster of residents including J-Felix (Tru Thoughts) and DJ Mo Fingaz (Main Squeeze) playing sweaty sounds from across the globe including House, Disco, Funk, Latin, Afro and Dub cuts from carnivals around the globe. This will all be topped off with over the top festival décor and production as well as face painters, giveaways, inflatables and much much more…. Brassroots exploded onto the London live music scene 7 years ago with a foot firmly in the first of the city’s brass bands to help establish a flourishing brass band scene in our nation’s capital. Brassroots has since set stages ablaze from Ronnie Scotts to Glastonbury, London Jazz Festival to Channel 4’s Celebrity Big Brother, Secret Garden Party, Standon Calling to WOMAD UK & Canarias, where 40,000 people gyrated to Brassroots on the streets of Las Palmas. The band’s current lineup has taken the signature Brassroots’ sound to a whole new level recently incorporating cleverly and subtly adapted electronic elements using effects pedals and various frequency manipulation techniques. The group has also begun to include vocals in their original music, which we can't wait to hear on the night. Brassroots is consistently billed amongst the cream of the crop in the U.K.’s music scene and considered amongst the best of international brass bands!